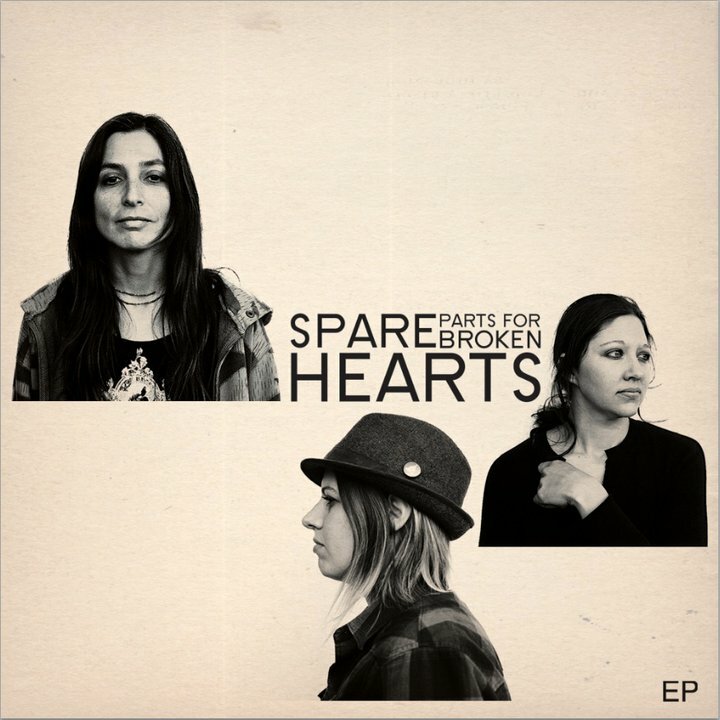 I recently got to speak with Long Beach-based three-piece Spare Parts For Broken Hearts, touching on all facets of the band, which consists of drummer Tosha Jones and Sarah Green and Laurita Guaico, who both sing and alternate guitar and bass duties. We discussed their awesomely powerful hard-to-pigeonhole sound, touring, and their EP which is available on iTunes and CD (the physical copy can be obtained at their shows or if you get in touch with the band through their Facebook page facebook.com/sparepartsforbrokenhearts). FIRST OF ALL, I SAW YOU GUYS IN DIFFERENT FORMS HAVE PLAYED TOGETHER BEFORE THIS BAND. HOW DID YOU EVEN FIRST MEET, JUST FROM THE LOCAL SCENE? Sarah: Well, Laurita and I met back in 1999. 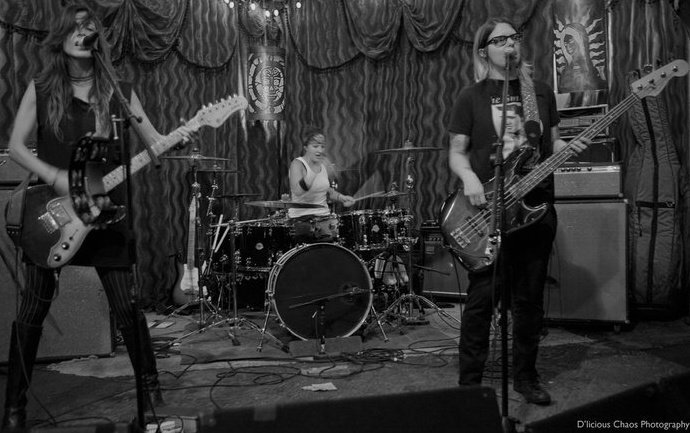 She was in a band called Relish and they were having auditions for a bass player and I auditioned for that and ended up joining it and that band disbanded in I think 2002 and we all went on to play in different bands and do solo projects. And then years later, what year did you meet, Laurita? So Tosha met Laurita in 2007 because she was in a band called The Randies and they were auditioning drummers and so they auditioned Tosha in Indiana. The Randies came to Indiana in 2007. I did a soundcheck with them and then I joined them on the Warped Tour the next year in 2008. DID YOU DO THE WHOLE THING OR JUST SOME SHOWS? Sarah: That was the whole Warped Tour and that was the same year I flew out there to meet with the band and help them out while they were on Warped Tour, and that’s how Tosha and I met. 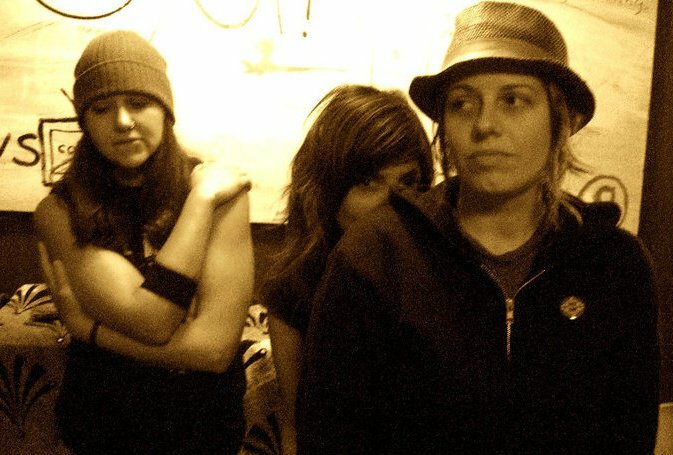 Then later that year they disbanded and then the beginning of 2010 we started Spare Parts For Broken Hearts because Tosha and I knew Laurita from being in Relish and that’s how this band started. YEAH, THAT’S COOL YOU KNEW EACH OTHER AND THE MUSIC YOU LIKED. SO WAS IT KINDA I GUESS YOU HAD A GOOD IDEA WHAT SOUND YOU WANTED TO GO FOR? Sarah: Well, we kind of had an idea of at least how each other played. And we didn’t really know how all three of us, what kind of music was gonna come out of all three of us being together but I mean, for myself, I knew that Laurita was the best guitar player I knew and Tosha was the best drummer so I knew no matter what influences or what music was coming out that it was gonna be good. AND I SAW SOMETHING QUICKLY, YOU SARAH, AND LAURITA, YOU SWITCH UP WHAT INSTRUMENT YOU PLAY? Laurita: It’s kind of whoever writes the song tends to stick more to the guitar. Which is really nice because we both really love guitar and bass. WHEN YOU’RE PLAYING LIVE, DO YOU KINDA GEAR THE SETLIST TOWARDS TRYING TO KEEP IT WITHIN THE SONGS WHERE YOU PLAY GUITAR TRY TO GROUP THEM TOGETHER SO YOU DON’T HAVE TO SWITCH UP THAT MUCH? Laurita: Unless we have a longer set we kinda get a little more flexible, but when we have a tight half-hour set we really have to just keep very short just moving fast and we cannot switch as often as we would like. Sometimes you wanna separate the songs where maybe Sarah sings one and then I sing one and kinda break it up a little bit it that doesn’t always work out that way. ABOUT PLAYING LIVE, HOW MUCH TOURING HAVE YOU DONE IN THE PAST? Sarah: The furthest we’ve gone, we have a route we started to develop through Northern California, San Francisco, we’re going back up there in August, we’re hitting Sacramento, Oakland, and then we’ve gone over to Vegas. We kinda set up this little route that makes sense and financially makes sense and the shows make sense. AND YOU SAID THAT’S IN AUGUST, DO YOU HAVE ANYTHING ELSE THAT AT LEAST TENTATIVELY PLANNING OR YOU JUST TAKE IT AS IT COMES? Sarah: We’re talking about recording again, so our focus is kind of split right now on doing those shows in August and building a little tour around that and then trying to get in the studio and have something to tour that’s new. OH, DID YOU PLAY SXSW THIS YEAR? 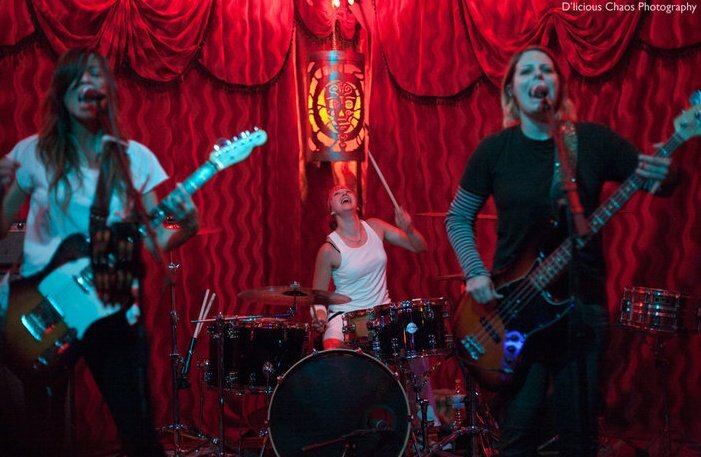 Sarah: We were invited to play SXSW this year but unfortunately Laurita got really sick the week before we were supposed to go down there so we ended up staying back and writing new material and making other plans. But we hope to be back there next year for sure. SO THIS EP CAME OUT LAST YEAR? Sarah: Yeah, that was last year. SO THAT WAS FOUR SONGS. HOW MUCH NEW MATERIAL ABOUT HAVE YOU BEEN WORKING ON? Sarah: Well, between Laurita and I we have a whole catalogue of songs that I’ve had as a solo artist and she had written in other bands that had belonged to her, so we have tons of material. But what we’re trying to do is jam a lot, and what Tosha brings to the table really ties together what our sound is about so at this point if we wanted to go into the studio and make a full-length record we totally could. We have enough new material that we have in the works but we don’t know if that’s the direction we wanna go or if we wanna release a few EPs and singles at a time and keep people interested and locked in. We haven’t really gotten that far, just making sure we have really good material that we have to put – if we did do a full-length record we wouldn’t want filler in there. Yeah. [Laughs] “I like two songs” and then the rest…! I always think about the band putting [a record] out, you have to I think be proud of it and feel everything. I can’t imagine putting out something that you feel, “All right, it’s kinda okay.” You want it to be the best it can and you want it to stand the test of time. But like you said, you each have different material that you’ve worked on [on your own] but when you all write together, how does that work? Tosha: In my opinion, it’s kind of scattered. Sometimes Sarah and Laurita will work on a song they’ve been working on at home and they’ll bring it into the studio and we will work on it together. But the last couple of tunes we’ve written have been in the studio with all of us, right? Laurita: Yeah, if it grooves and we really like it and if it’s strong enough we develop it into a song. Tosha: But we’ll record it on an iPad or a phone and we’ll just kinda pick it apart from there, and if it keeps popping up we just keep jamming on it. The last couple of songs we’ve written have been that way. I like that though. I like doing that with the three of us. AND THE LYRICS ARE WRITTEN AFTER YOU HAVE [A FULL SONG]? OR DO YOU HAVE LYRICS ALREADY AND SEE IF YOU CAN PUT IT TO A SONG YOU’VE COME UP WITH? Sarah: I can’t ever write lyrics before a song. I’ve never done that and I’m just not capable of it. I don’t stand against it, it’s just not how I work. I have to feel what’s happening first and it inspires more of the formation of syllables or capture this kind of words that sound like they should be in these spots and then kind of build sentences or phrases or pieces around that. And I think between Laurita and I since we’re both lyricists in the band, I think whoever feels more like yeah, I’m really feeling this song will spend more time with it in general. I GUESS THIS IS FOR BOTH YOU AND LAURITA, WHAT INSPIRES YOU LYRICALLY AND SPURS YOU TO WRITE? Laurita: I always am inspired by something that’s going on in my life. Usually if I’m happy I don’t get that inspired. When stuff gets intense in my life is when I get more creative and I’m more inspired to write and express myself. It’s always about experiences, relationships or life or just questioning certain beliefs or what you feel about certain things but something has to be going on in my life and then it triggers lyrics. And sometimes it’ll take me six months to write a song. We have a song called “January Thru July 1998” on the EP. The reason why it’s called that is because it took me six months to finish the lyrics and if you listen to the lyrics, they’re all about something different, something that I was experiencing at that time inspired me to write that verse and then the next verse is something totally different, whether I read a book and something I read inspired me. It was pretty random, so that happens to me often. YEAH, I WAS GOING TO ASK ABOUT THAT SONG. SO OKAY. AND THEN SARAH, WHAT ABOUT YOU? Sarah: I have a tendency to stick with the same theme and it’s usually some sort of desperate pleading for attention or mashed emotions with somebody, sort of what naturally transpires and runs through my veins and I try to escape it but that’s usually where it ends up. EVEN ONE THING ABOUT THE EP, I JUST GET THIS, IT’S TOTALLY EDGY BUT THERE’S SOMETHING GORGEOUS ABOUT IT, YOU KNOW WHAT I MEAN? IT’S PRETTY POWERFUL. YOU CAN DEFINITELY FEEL ALL THE PASSION YOU GUYS HAVE. WHEN YOU PLAY LIVE, WHAT’S THE EXPERIENCE LIKE FOR THE AUDIENCE DO YOU THINK? Sarah: I think it’s interesting. Thank you for using that word by the way. That’s a nice word. I think it’s interesting you feel that from the EP because I feel like all of the things that are living and gorgeous about the EP are kind of condensed and caged within the recording. Our live set definitely if you can get that from the EP when you’re standing in front of our live set I really feel that that’s where you can understand where that energy goes between us and the audience. There’s some sort of tension that exists between us and them. But at the same time it’s connected if that makes any sense. It feels like an exchange of emotions and tension that’s just being released from both sides. At least that’s the way I experience it. And people seem to grab on to it. I think all three of us definitely our stylewise playing is with a lot of intensity. That’s definitely the feedback that we’ve gotten. I LOOKED QUICKLY, I GUESS IT WAS ON YOUR FACEBOOK PAGE AND IT HAD EACH OF YOUR INFLUENCES, I SAW SOMEONE PUT FUGAZI, I’M LIKE, I CAN SEE THAT. Laurita: Yeah, I was a Minor Threat fan when I was a kid and then once Fugazi came [around] it was the most insane band ever. I was blown away and the dynamic between Guy and Ian live is insane. I kinda feel like me and Sarah tap into that a little bit actually, the back-and-forth vocals, onstage too. We even do a Fugazi cover too, which is funny. “Waiting Room.” It’s their radio song. But it’s a good one. It’s a crowd pleaser and then sometimes you have a show where people sometimes don’t get you but if you play a cover sometimes it kind of bonds you a little bit more with the audience. AND JUST ABOUT LIVE AGAIN, WHAT ARE SOME OF THE PLACES AROUND WHERE YOU ARE THAT YOU PLAY? YOU PLAY ALEX’S BAR? Sarah: Yeah. We don’t play there too often, it’s weird ‘cause Long Beach has a lot of cool spots and we get offered to play quite a few of them. We could play Long Beach every week for the rest of our lives which would be awesome, but we gotta do a little bit more than that. Alex’s Bar we kinda reserve for the bigger shows. We have on July 25 we’re opening for The Ettes and that’s gonna be a bigger show for us because they’ve got a good following. We love even though The Prospector doesn’t have the best sound it is always a good time, it’s always a good show for us. Other than that we kinda bounce around, random venues between here and L.A., San Diego, we have a spot that we always play. But definitely around here Alex’s and The Prospector seem to be our main ones. YEAH, I WENT THERE ONE TIME, ALEX’S BAR, MAYBE 2010 OR SO [FOR ILL REPUTE!] AND THOUGHT THAT WAS A COOL PLACE AND SAW YOU WERE FROM LONG BEACH SO I FIGURED I’D ASK ABOUT THAT. Laurita: You know where they filmed True Blood, the bar? That’s where it’s filmed. AND LIKE YOU SAID NEXT YEAR IF EVERYTHING GOES WELL YOU’LL TRY TO DO SXSW. Sarah: Or a couple months or a couple years. Laurita: Whatever we end up recording, whether it’s an EP or an album, it’d be great to have it and then tour it. Right now I feel like that EP, what we sound like now, some of the songs are on there, but I think we’re kind of – I don’t know if it captures us entirely. It’d be exciting to have something a little bit more current. YEAH, IT CAME OUT EARLY LAST YEAR? Sarah: May of last year. So a year ago. BUT YOU MENTIONED ABOUT GETTING TO TOUR EVEN JUST WEEKENDS, SARAH, YOU MENTIONED THE NEXT THING YOU HAVE UP YOU’RE HITTING VEGAS TOO? Sarah: We got asked to do Vegas around September. We’re definitely going to be up in San Francisco, Sacramento, Northern California, in the middle of August. I WAS WONDERING HAVE YOU PLAYED VEGAS BEFORE? WHERE DO YOU ACTUALLY PLAY? THAT’S A WEIRD CITY. Sarah: We got it through an agent. It’s not the Double Down Saloon. Bungalow something. It’s right off the strip. It’s cool. WHAT TYPE OF BANDS DO YOU LIKE TO PLAY WITH? Tosha: Totally. I don’t want us to sound like anything else and everything we write pretty much all has a different sound to it and I don’t wanna get stuck into a certain sound or a certain genre either. YEAH, EVEN ON THE EP THE SONGS DON’T SOUND THE SAME. Sarah: Yeah there’s definitely a huge range of diversity and that carries through in our live set too. ON THE INITIAL LISTEN, WHEN I FIRST HEARD “JANUARY THRU JULY 1998” I WAS THINKING – OF DO YOU REMEMBER VERUCA SALT? THAT KINDA CAME INTO MY HEAD. I DON’T KNOW IF YOU WERE INTO THAT BAND. Sarah: Yeah. We’ve probably heard that a few times, huh? Laurita: Yeah. In the last interview. Laurita: I liked their harmonies. And they weren’t that girly either. Really catchy songs. WHEN YOU GO OUT TOURING, DO YOU HAVE A VAN OR YOU RENT SOMETHING? Sarah: We actually between the three of us have so many cars. Laurita actually has an RV which is really rad except the gas is like five dollars a gallon so we can’t really take it anywhere. That was what we had when all of us were on the Warped Tour that one summer. That covers hotel and driving which is really cool. It’s just too expensive. She’s got a hybrid which is really cool ‘cause we have two sets of amps, we have our big amps and we have small amps and small amps can all fit in the hybrid and we can just go to where we need to go. That’s probably what we’ll do when we go up [north]. And then between the three of us, I have a truck and they have medium-size SUVs so we have a lot of options. None of them are as fuel-efficient as the hybrid so that’s what we’ll do.